Finding a parking spot is a nightmare for many drivers in Seoul. The problem is especially severe in low-rise neighborhoods that lack big underground parking lots common to department stores or apartment complexes. About 80 percent of the 3 million parking violations in the capital each year take place in these back roads, usually in permanently reserved spaces for residents or fire trucks. The violators are usually customers of shops or visitors to households in the area. Daunted by the high costs of creating new parking spaces in downtown Seoul, the city decided to better allocate what it already has to drivers at the right time and place. After all, Seoul has 3.4 million parking spaces ― for more than the 2.6 million vehicles currently registered in the capital. The "vacancies" the city turned to was resident-priority parking spaces lining the back streets of low-rise residential areas. Almost every inch of unused roadside space is allocated to the area's residents and reserved for them 24 hours a day, guaranteeing them a parking spot to return to near their home after a long day at work. But this resident-first permit system, based on a 1996 city ordinance, also leaves a good number of parking spots empty during the day. 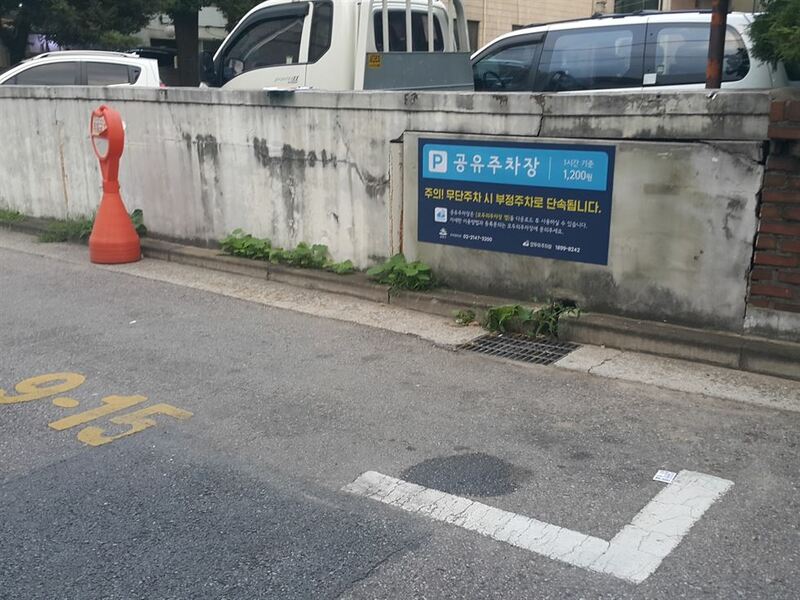 To make use of these temporary vacancies, Seocho-gu started experimenting with the first sharing scheme for resident-first parking spots in 2016. After a year, the number of resident complaints about parking violations by visitors dropped by 60 percent. Other districts followed suit. Heartened by the results, the Seoul Metropolitan Government brought all 25 districts onboard on a plan to eventually turn all 125,000 resident-first parking spaces in the city to public parking spaces during the day. Twenty-two districts partnered with the ModuParking ("Modu" means everyone in Korean) app to match idle parking spaces with temporary visitors. On the app, residents can register their priority parking spaces during chosen hours of the day, allowing visitors to book available spots near them for as little as 600 won per hour ($0.5) to 1,800 won ― much cheaper than fees charged by private parking lots. Residents have clear incentives to register their priority parking space on the sharing platform. They can earn part of the profits, get a 50 percent discount when renting similar parking spaces at other neighborhoods, and earn a chance to get a more favorable parking spot near their home at the next allocation date. As of December, 2,895 resident-priority parking spots were registered for booking on ModuParking's mobile app, according to the latest data from its developers. Around 6,897 bookings were made on these niche spaces last month, a big jump from around 3,153 in January last year. There are also other methods than the ModuParking app to carry out the parking space sharing scheme. Yeongdeungpo-gu partnered with an app called Parking Friends which allows residents to check on who is using their priority parking spaces with real-time video footage. Eunpyeong-gu uses a phone call-based booking system. Gangnam-gu says it will develop its own app, carrying out the registration and booking process in paper forms at its district office until then. "In a city like Seoul, a single parking space can cost an average of 80 million won. This sharing scheme saves costs and actually allows residents to keep other vehicles from taking over their priority parking space indefinitely by accepting a rotation of timed, paying vehicles that are registered with the app," said Choi Jung-hoon, a city official in charge of the project. "It's also helping residents see their priority parking spaces as a public good rather than a private space they have a monopoly over." The initiative has the public's backing. A recent survey of 1,000 Seoul residents showed 95.7 percent wanted to see parking space sharing schemes expanded ― higher than the 93 percent who said the same of Ttareungyi, Seoul's popular bike rental service.